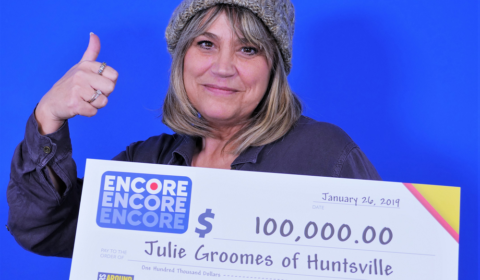 HUNTSVILLE — Congratulations to Julie Groomes of Huntsville after winning a prize worth $100,000 with ENCORE. Julie Groomes, 53, plans to go to Costa Rica and pay bills with her Jan. 19 lotto winnings. On Jan. 19, playing LOTTO 6/49, she matched six of seven ENCORE numbers in exact order to win the $100,000 prize. “I buy my LOTTO MAX and LOTTO 6/49 tickets with ENCORE online, because I always forget to check my tickets,” said the 53-year old personal support worker, while at the OLG Prize Centre in Toronto to pick up her winnings. Following the draw, she received an email and discovered her windfall. “I spent most of the day in a daze,” she smiled. Married for 22 years, she plans on paying bills and travelling to Costa Rica. The winning ticket was purchased online at PlayOLG.ca. PlayOLG.ca offers Ontarians a convenient way to purchase LOTTO 6/49, LOTTO MAX and ENCORE tickets, and features a wide range of interactive casino-style games. The site’s Never Miss a Draw service allows lottery players to purchase up to a year’s worth of draws in advance for LOTTO 6/49 and LOTTO MAX.